Located in beautiful Santa Monica, CA, one block from Third Street Promenade, Naam Yoga® LA is a non-profit 501 c(3) yoga, meditation, research and healing center. Our spacious 7000 sq. ft. venue offers cathartic sun-drenched studios, a boutique, private healing rooms, a gracious communal area and over 100 classes a week. Universally inspired, the center also offers a wide range of yoga disciplines, Universal Kabbalah workshops, dance and movement classes, Pilates, Zumba, and meditation. We are a welcome destination for thousands of students from all over the world taking part in our Naam Yoga and Harmonyum Healing certification programs, classes, events and workshops. Naam Yoga merges the precise science of breath, sound, movement, and mudra therapy (hand postures) with the practical application of the laws of nature using the wisdom of Universal Kabbalah for total wellbeing and happiness. Recognized by the Yoga Alliance as a Yoga Therapy, Naam Yoga is physically and spiritually therapeutic and rehabilitative. It is for people of all ages and all levels of flexibility. Anyone can do it! Naam Yoga is also one of the fastest growing styles of yoga in the world. 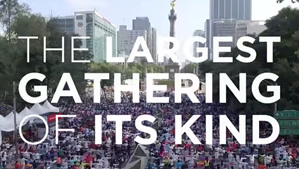 Since 2011, three world-record setting Naam Yoga classes dedicated to peace and healing, led by our founder, Dr Joseph Michael Levry, have taken place in Mexico City: Zocalo (12,000 people) in 2011; Revolution Monument (15,000 people) in 2012; and the Angel of Independence (21,000 people) in 2014. Naam Yoga LA's mission is empowering people to transform their lives and create positive change in the world, through the science and wisdom of yoga and sound meditation. It is our honor and privilege that our founder, Dr. Levry teaches Shakti Naam Yoga Master Class, Wednesdays from 7-10pm at Naam Yoga LA when he is in Los Angeles. Don't miss this opportunity to experience this gift to learn directly with Dr. Levry. Dr. Joseph Michael Levry is an author, composer, international speaker, producer of sacred music and dedicated teacher. In his work, Dr. Levry pursues his vision of providing humanity with tools for a healthy lifestyle, peace and happiness. His student base includes people from all backgrounds, age groups and spiritual orientations. The Santa Monica Chamber of Commerce commended Dr. Levry as a �Global Visionary� and �Local Leader� for both his international and local contributions to community. Click here to visit the Official Website of Dr. Joseph Michael Levry to learn more. Vocal Yoga explores the body as an instrument of the voice, while using the vibrational force of the voice to heal the body. Jenny Cho is a certified Vocal Yoga, Shakti Naam and Naam Yoga Therapies teacher and certified aromatherapy practitioner. The New Moon marks the beginning of a period when the universe is on your side for manifesting and bringing new things into your life. Initiates throughout the ages knew of the powerful time of the waxing moon and it’s applications for health, prosperity and success. Come and learn the science of Divine Spiritual Wisdom so that you too can apply these universal laws and live in service of your highest self. We will work with various breath and meditation exercises, healing sound currents, the archangels, and other tools that have been handed down from mouth to ear since the beginning of man. The all-purifying Fire is worshipped all over the world in one form or the other. Fire is the only means to develop a direct link with the deities and supernatural powers. The ancient Vedic seers named this practice as Yagya.. Many types of help can be sought with the help of yagyas. Yagya can help cure diseases, destroy enemies, control turmoil, seeking divine help for solving problems that defy mundane solutions, peace to the departed souls, tasks that seem impossible can be done with the help of yagyas Yagyas are unique miraculous processes of Indian occult sciences that can provide help in all fields and problems in every way. Peace, prosperity, wealth, health and all round development and upliftment can be achieved through yagyas as it has been told in ancient Vedic scriptures. The ancient rishis and seers evolved various methods of yagya. Mantras and yagya and meditation deliver results only after constant practice, true faith, devotion, dedication, determination and patience. In the past 4 years we have served over 60,000 people with over 9,200 classes. A big thank you to our Naamazing sponsors! Through annual fundraising campaigns, the outreach and charitable arm of Naam Yoga LA, called Giving Naam, supports and expands our community and therapeutic programs worldwide. Would you like to become a community partner and bring Naam Yoga classes to your center? Please contact us [email protected].